Every mother is concerned about the health of her child. The mother wants the kids to grow strong; some of the motherâ€™s are also concerned about the health of her child because they suffer through the problem of child obesity. The concern of the mother is absolutely natural. 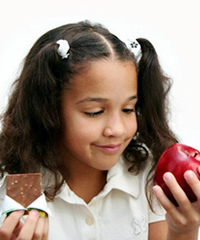 The tips for the children to grow healthy and strong include fruits and vegetables. Make sure that the child has at least 5 fruits a day. Generally children donâ€™t like fruits and vegetables; even if you tell them itâ€™s healthy they wonâ€™t eat them. Try and put some vegetables and fruits in the food they like such as broccoli in macaroni and cheese. Cut the fruits and vegetable in exciting shapes, this will make the child consume the healthy food happily. At a very early age you have to get the child used to the healthy food. Apart from eating let them taste, smell, touch and play with food. Let them mix some ingredients and try them, get them used to vegetables at an early age this would help build healthy eating habits. One of the most important health care tips for children and for adults is to have breakfast; this would avoid them from being overweight. Apart from that the child would also have a healthy start. Apart from this try to set aside your meal as family time this would amend the eating habits of your child. Keep this tradition as they grow, they will grow healthy and make sure you eat healthy as well.